← Why can’t writing be fun? Phil: My life is full of “time hurdles”. Let me explain. I look at my calendar when I’m busy and think “It’s OK. After such-and-such date/event, things will settle down”. Each date or event is a “time hurdle”. Once I jump over it, things will be different. Hopefully better. Time hurdles are fixed points on the calendar. Sometimes I can’t see beyond them. Not literally you understand, I’ll still book other things in and in my rational mind, I know that there will be days after the hurdle, it’s just that everything after that date has an air of unreality about it. I know they exist, but in a slightly etherial way as though I know, but don’t believe. 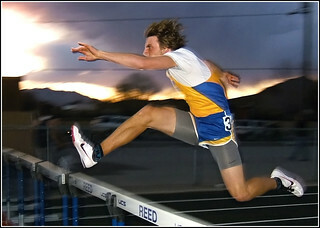 There are especially big-time hurdles. Holidays, hospital appointments, big/serious work meetings, new jobs, weddings etc. I imagine those to look like the massive walls found in some showjumping events. Beyond these, the view is distinctly misty. Most of the time though, the hurdles are smaller. I’ve just taken part in a show that required quite a bit of preparation. Now it’s over, the next hurdle is some filming work I need to get things ready for. After this, I believe the rest of the month should be plain sailing. But will it? As the hurdle gets closer, I find it easier to concentrate. My focus becomes laser-like. I imagine a horse feels the same heading towards a jump. I actually achieve more. The plain sailing bit is where you need to keep a foot on the accelerator (yes I know I’m mixing metaphors, get over it) and get stuff done while the next hurdle is in the distance. I look forward to this coasting phase but know there are probably things I should be delivering. Things the approaching hurdle has permitted me to ignore for a while. Does anyone else look at the calendar and feel like this?